Obstinate Baloth has been recovering from its dip a few weeks ago. It should never have gotten so low in the first place. It is a powerful sideboard card against Liliana of the Veil and other discard cards. It comes down as a solid 4/4 four four mana while buffering your life total against burn or helping a midrange deck recover from early aggression. It shows up in Melira Pod, Abzan Midrange, Jund, Scapeshift and Temur Tempo decks among others. I believe it is rightfully returning to $2 but I do not see it growing too much further than that. You can still purchase them for as little as $0.76 and sell them for $1.10. They also make excellent toss ins to even up deals. Sylvan Caryatid is going to be used in every single standard deck that runs green and any other combination of colors. It will help you fix your mana for wedges and accelerate into a turn three Polukranos or Xenagos, the Reveler. It is playable in three out of five wedges and will be a workhorse in any attempt to make five colors work. I am ready to declare it the most played creature in standard six weeks from now. It was the Buy a Box promo for Theros and a rare in a heavily opened set but I will not be surprised when these sustain $15 for the rest of their time in standard. Everyone is busy talking about wedges and new three color decks but some people are going to look at tried and true block strategies like Monogreen Devotion. There are a host of powerful creatures to help build devotion and she has been seen in two color builds like Gruul Devotion and Golgari Devotion as well. She makes an easy splash and helps your big creatures get through for damage. Unfortunately she sits in the already crowded four mana spot on the curve. She will certainly see $8 but I do not think she will quite see $9. The important thing is that she is getting attention so you can trade her away for maximum value and let others work out her role in the new standard. Fabled Hero has proved potent in block Azorius Heroic and Naya Aggro strategies. You can throw powerful bestow creatures and auras on him and let him wreck your opponent. Will he see play? I do not know. I do know that his foil can be purchased for as little as $1.49 which is almost the same as the regular copies. I would grab foils as a hedge with minimal investment. If he sees any play then I could see the foils hitting $10 without any problems. If not you can still try get out without losing your shirt. Nyx-Fleece Ram has had a tremendous impact for an innocuous creature. It helps create a life buffer and holds back even Goblin Rabblemaster (when did he become $10?!) and even the most Temur of 4/4s with ease. It is currently being played in Orzhov Control, Esper Control and Boros Aggro. Each of these decks was already interested in life gain. I believe he will have a role in the new standard but as an uncommon $2 is about the best it can hope for. Banishing Light from the same set is $3 and that is an answer to Planeswalkers, gods, fatties, and a host of things the humble Ram can only gaze upon with dismay. I would move them and get the $0.90 buylist or $2 trades for cards that look like draft droppings. Thought Reflection feels like exactly the kind of overcosted binder bulk that sounds like a fun inclusion in a Commander deck. The problem is that at seven mana it still does nothing on its own. Consecrated Sphinx just does so much more and costs less to cast. Staff of Nin is better most of the time and is cheaper. It can be purchased for as little as $0.16 and sold for $0.37. That said you can still buy Thought Reflection for as little as $0.49 and sell them for $0.53. Get used to Mana Confluence because you are going to be seeing a lot of them. Every midrange three color deck is going to want some number in their decklist. Many two color aggro lists could play them and enable a splash card in the sideboard. There are even enough cards that provide incidental life gain like Nyx-Fleece Ram and Courser of Kruphix that negate the downside of Mana Confluence entirely. Speaking of Courser of Kruphix you can still buy them for as little as $9.90 from some vendors and sell them for $11.21. This is despite ready availability from Clash packs. Modern uses them in Ad Nauseam. Both Legacy and Vintage dredge decks run a play set. Mana Confluence will be a seeing $20 soon. I would wait for that time and trade or sell them. I think that they will be at least $15 for the rest of their life in standard. In the long term this may be as cheap as they get until a reprint so if you want them for Legacy I would bite the bullet and get your play set now. Soldier of the Pantheon looked like a hedge against powerful multicolor threats from Return to Ravnica. Now it is being considered again as an answer to powerful wedge cards. It is already used in Selesnya Aggro and Brave Naya lists. If there is a white weenie build in Khans standard this will certainly be a headliner. It will also be in white control sideboards to hold back threats like Zurgo Helmsmasher indefinitely. You can still pick them up for as cheap as $1.26 and sell them for as much as $1.70. Is Keranos the God of Hype? Any number of authors have espoused him as a patron of card advantage. He is in decklists in every single format. He can help you dig for spells, destroy creatures or is simply a clock for your opponent. In a world where players life totals are gouged by fetchlands, painlands and Mana Confluence a free Lightning Bolt or two can make a huge difference. He has grown a lot from the $7 he was a month ago. If you got in at $8 when I told you then take your profit and be on your way. If you are a gambler you can wait just a little longer. He will still see $20 but I am hesitant to say he will get to $25. There is nothing wrong with getting out now. Corbin says you should leave the last 10% to the next guy. 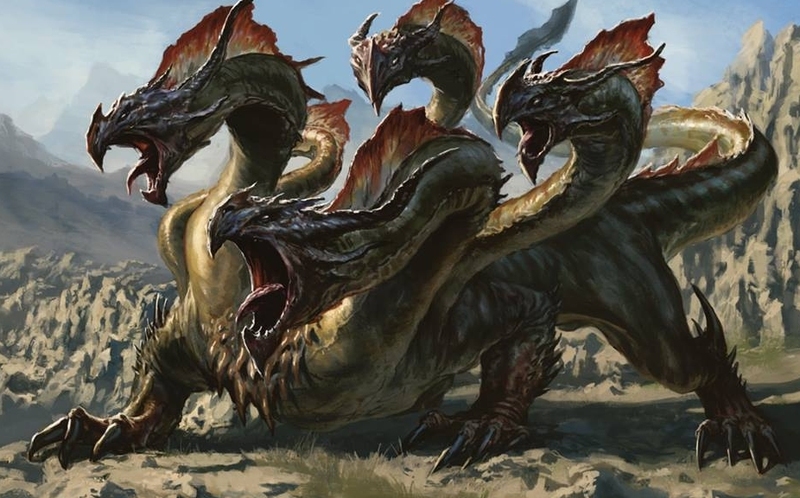 Standard Gruul Devotion, Monogreen devotion, Golgari Rock, Jund Monsters and Golgari Chord all run this monstrous hydra. It is a potent threat and can clear the board of annoying utility creatures like Soldiers of the Pantheon or Elvish Mystic. He was in Theros and the Heroes vs Monsters duel deck. He is already being listed at $15 by some vendors. I really like the foil copies that are only $12.70. They are not as diluted and have more room to grow if it becomes the role player we all think he will be. The Modern mana fixing monopoly of Zendikar fetchlands has come to an end. Scarcity will do a lot for you but when there is a supply shock in cards that can fit your roles then that will take a toll on you. People have already been speculating on whether these will be reprinted in Louie or Modern Masters 2. I almost think that the Onslaught fetchlands will make this a moot point. You no longer need to pay $300 to $400 for a playset of lands like you would have earlier this year. Here are the individual break downs. This is used in modern Jeskai Control, Red Deck wins and Burn. Legacy uses it in Jeskai Miracles, Jeskai Delver, Burn and Imperial Painter. Modern uses Catacombs in Jund and Golgari Rock. Legacy uses it in Elves, Shardless sultai, Sultai Delver and ANT. The mighty have fallen. Modern Twin Exarch and Izzet Delver use Tarns. Legacy uses them in Jeskai Miracles, Azorius Miracles, ANT, OmniTell, Jeskai Delver and Burn. Rainforests are used in modern Twin Exarch, Izzet Delver and legacy Shardless Sultai, Storm, OmniShow, Elves, and Stoneblade decks. Modern uses it in Jund, Boros Midrange and Abzan. Legacy uses it in Shardless Sultai and Esper Stoneblade. The bottom line is that all of them are still role players in major decks in eternal formats. I think the new prices of $30 to $50 are still respectable but with the new fetchlands commanding $15 to $20 each I could still see some room to drop a bit. I told you to move them if you are not playing with them and that holds true now more than ever. Anyone who was sitting on them may start to cut their losses. That will increase the copies flocking to buylists and eBay. This will put further downward pressure on the price. I would say get out but even that advice is too little too late at this point. Mutavault is used in standard Monoblue Devotion, Monoblack Devotion, Red Deck wins and basically almost every other deck in the format. In eternal formats it is used in modern and legacy Merfolk and Modern UB Faeries, Esper Delver and even Twin Exarch. It will take a beating as copies are sold off at rotation but the roles are filled. Mutavault will continue to lose steam until it gets to around $15. The Conspiracy reprint really killed this card. It is still used in modern Kiki Pod, Cruel Control and even Bloom Titan but usually only as a single copy. It is unfortunate that you need to have the mana already available to make this card shine. It is a popular inclusion in commander decks of all shapes and sizes. You can still buy them for as little as $4.95 and sell them for $5.76. Standard control decks that include black will want this to help fix their colors. If you want to cast a host of 2/2 zombies at your opponent’s end step then this is the card that can help you get past the four black mana in the cost. Modern uses it in Abzan, Gifts Control, 8rack and Dead Guy Ale. Legacy uses it in Loam, Tezzeret, ControlPox and Stoneblade. You can still get them for $7.60 and sell them for up to $10.01. It is next to impossible to reprint and is used in modern Splinter Twin, Jund, Temur Tempo, Tarmo Twin and Kiki Pod. Legacy even uses it in Nic Fit. This is probably the cheapest you will ever see it and it has plenty of room to grow. I would trade for them aggressively. You should focus on cards that aren’t worth $1. People don’t care if near bulk rares go up 10%. If you can buy x for 14 cents then buy list for 30 you double your’ money,we’re sharks peasant. What threshold would be more helpful? It is easier for a $1 card to get to $3 or $4 rather than a $10 card to suddenly get to $30 or $40. You can still profit on smaller values. When I buy and sell collections the real money for me is picking up all of the commons and uncommons that people mix in bulk and buylisting it. Lol at Metalworker going from $10 to $30 just as you publish this. Good point. It is not every day legacy staples become unnamed in commander. In the defense of weekend updates, they’re usually not focused on dollar cards. However, I must admit that last week we didn’t see an update, and this week we’re talking about two uncommons and two one-or-two-dollar-rares of the ten. I’m also surprised to see no mention of Eidolon of the Great Revel, which has gained around 20% in the last week to ten days. Lame duck standard does not make for the most exciting articles. Everyone is rightly focused on the new cards being spoiled and speculating on what it could mean for standard. Several staples saw growth and I have been discussing them. There was an article last week you can read at http://blog.mtgprice.com/2014/09/06/weekend-update-for-9614/ but of course the article’s information is a little old. I looked at around twenty cards this week (10 winners, a brief discussion of my thoughts on Courser and the 5 losers were augmented by the enemy fetchlands.) Some of them will be lower value items. no mention of foil thoughtseize? Foil Thoughtseize made its big push Thursday. The article was written and was been edited at that time. That is the reality of writing articles online. I do the research and write the article throughout the week. I submitted it a couple of days ago and it is posted today. Standard does not cause a jump like that in foils. The regular copies are not doing anything remarkable so we need to look at eternal formats. It has been a staple in modern and legacy for a while. Stoneblade has been doing well but not insanely so. Modern staples should see sustained growth as fetchlands and rotating shocklands make the format a lot more accessible. What are everyone else’s thoughts? Just to give a clear suggestion: I would sell mine into the hype if I had any. You got it backwards. Mana Confluence with only be played in significant numbers in aggro decks. Slow decks can’t afford the life loss from them, and are likely to play zero or maybe one copy. I think it will see play all over the place. Aggro decks definitely want them. If anyone can actually make the combo with Jeskai Ascendency work they can afford to lose a few life points. Midrange will have access to a number of effects that will mitigate the damage like Nyx-fleece Ram, Courser of Kruphix and Soldier of the Pantheon. Control will not want them as much but may place one to two copies. Foil thoughtseize up 60% this week and not a single mention? As I have stated in the ProTrader webboard, setting the threshold to $3-$5 is good. You would not get so many complaints like this. Also, Foil is another issue, might need to separate them into different ranking. I would be interested to see what everyone thinks about this. What should the minimum threshold for a card price? How about minimum movement for a card? Currently I try to make sure each card is at least $1 (but hopefully more) and moves at least 10%. What would be most helpful for you to see? In regards to Polukranos where you mentioned foil copies as a safe pickup: do you mean the dual deck foil or the regular set foil OR both? Thanks in advance and love the articles! I like the theros foil. Duel deck versions tend to stay closer to the non-premium price. I feel like your assessment of the zendikar fetches was a bit off. You listed a lot of modern decks that use the zendikar fetches but most of those decks could use the onslaught fetches as perfect replacements. Misty Rainforest sees play in many tier 1/2 modern decks however it is played as fetch 5-8 and only represents one color in the deck. BGX Rock decks, Pod, UR Twin, UR Delver and Storm can all replace Misty Rainforest with an equal if not better fetchland from Khans. I wouldn’t be surprised if Mistys continued to drop below Scalding Tarns. Great insights. I discussed the impact of allied fetchlands no modern mana bases in more detail last week. You are absolutely correct that they are going to be replaced enemy fetchlands in a lot of decks. This is what is putting the downward pressure on the enemy fetchlands.